From left to right: Mick Wasco, Marine Corps Air Station Miramar energy program manager; Richard Johnston, Naval Facilities operations and maintenance officer; Lt. Cmdr. Travis Brinkman, MCAS Miramar public works officer; Dave Guebert, San Diego Gas and Electric federal account representative; Scott Kinner, Black & Veatch vice president; Col. Jason Woodworth, MCAS Miramar commanding officer; Andy Haun, Schneider Electric chief technology microgrids officer; and Howard Ou, Congressional Office general services fellow. 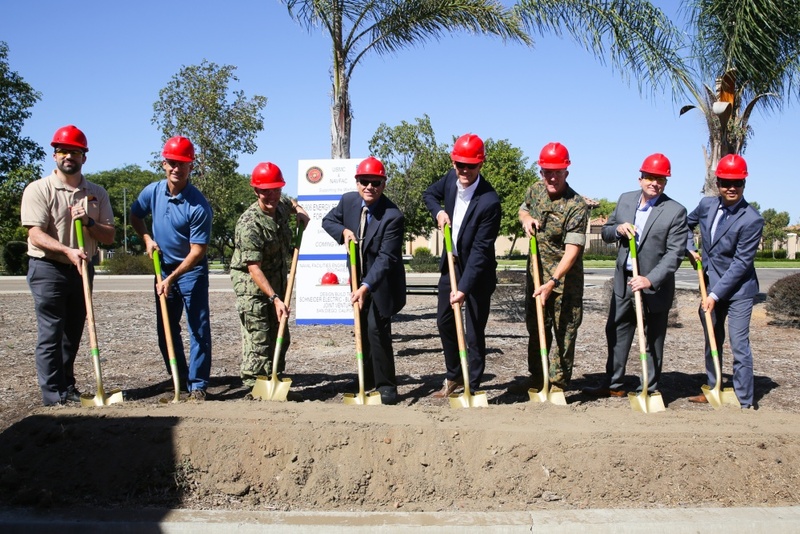 OVERLAND PARK, Kan., September 29, 2017 /3BL Media/ - U.S. Marine Corps and Naval Facilities Engineering Command Southwest leadership hosted a groundbreaking ceremony Sept. 28 celebrating the start of construction for an energy security microgrid at Marine Corps Air Station (MCAS) Miramar, in San Diego, California. Black & Veatch and Schneider Electric, in a joint venture, are providing design and construction support on the project. Once fully operational, the microgrid will provide resiliency, incorporate renewable energy, and allow operations at mission-critical facilities to continue if the utility power grid is compromised or damaged. The project is scheduled to be completed in 2018. Construction will include the buildout of a new diesel and natural gas power plant and refurbishment of an existing building into an advanced energy and water operations center (EWOC). The EWOC will provide microgrid and plant operators, and base energy personnel with direct control of the integrated microgrid control system, utilizing Schneider Electric’s OASyS SCADA software. The microgrid will also integrate existing power generated from renewable energy sources including biogas from a local landfill and solar photovoltaic (PV) generation, and future energy storage. Contracting activity was performed through the Naval Facilities Engineering Command, Southwest (NAVFAC Southwest). The 3rd Marine Aircraft Wing’s mission is to provide combat ready expeditionary aviation forces capable of short notice worldwide deployment to Marine Air Ground Task Force (MAGTF) fleet and unified commanders. The microgrid island at Miramar will cover more than 100 mission-critical facilities, including all flight line operations.